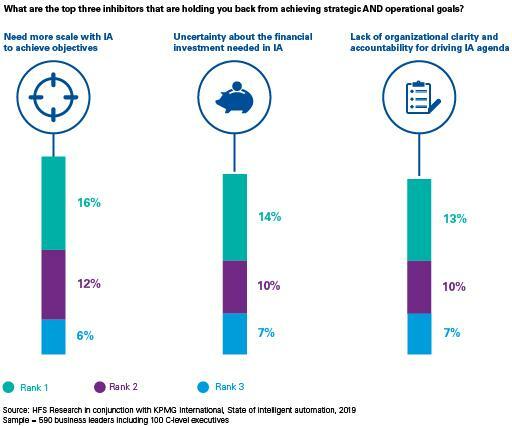 According to KPMG International’s new “Easing the pressure points: the state of intelligent automation” global survey, enterprises are not scaling intelligent automation (IA) technologies [artificial intelligence (AI), advanced analytics, and robotic process automation (RPA)] fast enough to meet desired objectives and returns. However, those organizations that are scaling IA technologies are seeing strong financial performance. Investment in IA tech is strong with 52 percent of companies confirming investments of more than $10 million; yet investments are imbalanced across functions – finance and accounting are seeing the biggest investments. There is a distinct correlation between scale and top financial performance. 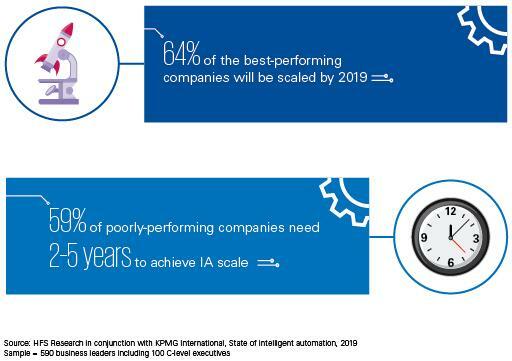 While 64 percent of the top performing companies surveyed will be scaled by 2019, 59 percent of poorly performing companies need another 2 – 5 years to achieve IA scale. Overall, only 17 percent of companies surveyed have scaled up or industrialized IA technologies. Smart analytics was cited as the top most scaled technology, while RPA was the least scaled. And, the technology that organizations are experimenting with or piloting the most is AI (36 percent). Scale remains a leading challenge to achieving key goals with IA technologies. Other notable challenges pinpointed include uncertainty about the financial investment needed; lack of clarity on accountability for driving the agenda; and concerns about changes in governance and risk management. Business executives are optimistic about the impact IA will have on jobs — approximately one-half of respondents surveyed say automation will impact fewer than 20 percent of their staff. KPMG feels these executives are overly optimistic. KPMG collaborated with HFS Research to explore how fast IA technologies are being adopted and what successes and challenges have surfaced. Nearly 600 business leaders including 100 top-level executives across six industries and 13 countries were surveyed about their experience with handling intelligent automation issues.